I remember the first time I heard “Brass Bonanza.” It was while I was playing NHL 94 on my Sega Genesis, something I wasted a lot of time doing as a kid. If I wasn’t outside playing hockey in the driveway, I was inside trying to master the wrap around move (you know the one) against the pixelated versions of Patrick Roy or Ed Belfour. That, my friends, is “Brass Bonanza,” hockey’s weirdest and most cherished fight song. To this day, every time I hear that tune, it brings me back to my early days of hockey fandom, but to many hockey fans in the northeast, it means so much more. The origins of “Brass Bonanza” begin in 19th century Belgium. Eugene Ysaye was a Belgian violinist, composer and conductor, regarded by many as one of the great violinists of his time due to his expression and unique use of vibrato. For classical music historians (shockingly, there aren’t many in the hockey community), his style of playing was a benchmark for violinists. He even found minor success in America as the conductor of the Cincinnati Symphony Orchestra. While this is all good and fun if you’re into obscure 19th century violinists, for hockey fans it was his grandson Jacques Ysaye who left a legacy. You’d be hard pressed to find much about Jacques Ysaye and his music career. Ysaye & His Orchestra recorded only two official albums of arrangements, including 1968’s Color in Music 1, but it seems he never got around to making a follow-up. There isn’t much to find about Ysaye anyway because he liked to compose under the pseudonym “Jack Say,” and Mr. Say didn’t leave much of a mark either. Since Color in Music 1 was released, Ysaye sold his compositions to a music publisher and has remained a recluse in Belgium, having never quite become the profound virtuoso his grandfather was. “I don’t know why the editor changed it,” says Ysaye. Nevertheless, the name stuck, and somehow it found its way to a house party of a WHA team executive in Hartford, Connecticut in 1975. Whalers announcers Bill Rasmussen and Bob Neumeier made an LP of the 1975-76 season highlights, and one of the songs they used as a musical bridge on the LP was “Brass Bonanza,” a song they purchased from a local music library. The song was a hit and from that moment it became the official fight song for the Hartford Whalers from 1977 – 1997. When the puck went in the net for Hartford, those first familiar notes would instantly blare in: “Da-da-da dadada da da!” “Brass Bonanza” became more than just a song to play after a Whalers goal. For the fans, it was their song, something that was unique to the team. It was part of their identity. Players and coaches seemed to love it. Ron Francis, in particular, was a supporter of the song. “Brass Bonanza” was the soundtrack for good times, and in turn, it became one of the most memorable songs in hockey. Yet, not everybody loved “Brass Bonanza.” As far as arena anthems go, it wasn’t exactly “Welcome to the Jungle.” There was nothing timeless about it. If you were an opponent, hearing the kitschy tune meant you messed up, and bombastic opening brass notes let you know about it. The song even rubbed some members of the home team the wrong way, like Gordie Howe who once said, after a while hearing it every night as a Whaler “began to drive me nuts.” Leave it to Howe to get annoyed by scoring goals. 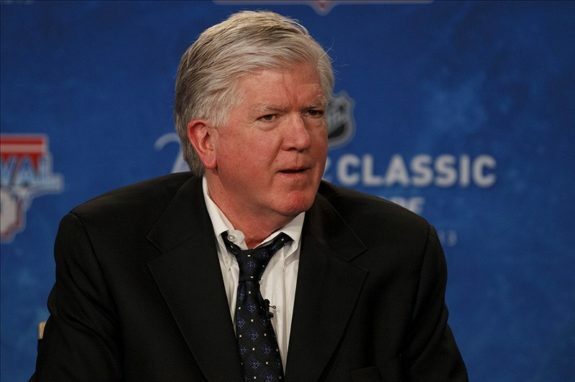 In 1992, Brian Burke became the GM of the Whalers. As the GM at the front end of a new decade, he wanted to revitalize the culture of the team which hadn’t won much of anything during its NHL existence. Everything from the personnel to the uniforms had to be changed, a measure that he hoped would create a winning mentality. Unsurprisingly for a man who apparently has never been photographed smiling, the first thing he wanted to do was get rid of the fan favorite “Brass Bonanza”. “I did because there were players who were embarrassed by it,” Burke later said. “Everything they had done in Hartford to that point had less than desirable results. We changed uniforms, we eliminated the fight song.” Burke made these moves in hopes of turning the team into a winning organization, but that didn’t exactly happen. The Whalers finished the season in 5th place in the Adams Division and 21st overall. Needless to say, Burke’s little experiment with the goal song didn’t work out, and he left the team after a year to work for Gary Bettman and the NHL. With Burke out of the picture, “Brass Bonanza” would make its return thanks in part to an unlikely hero. 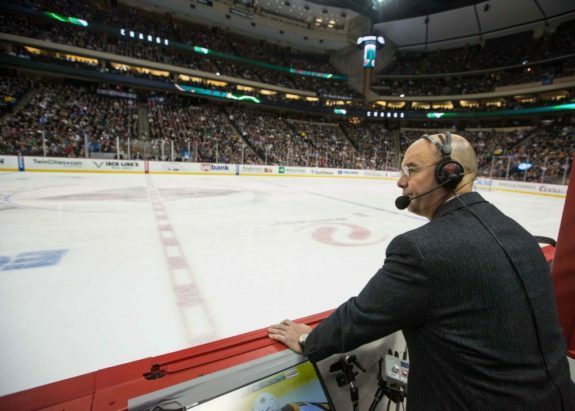 Pierre McGuire, born and raised in Englewood, NJ and a former standout defenseman for the Hobart Statesmen, became assistant GM of the Hartford Whalers in 1993 after winning the Stanley Cup in Pittsburgh the year before. Today, he serves as a human hockey encyclopedia for NBC Sports Network, but in the early 90s, it was McGuire who helped bring “Brass Bonanza” back to Hartford. For Pierre, who probably listens to the tune every day on his way to work, revitalizing the song was about keeping the fans happy, because let’s face it, there wasn’t much to be happy about during his tenure as Assistant GM and Head Coach. As far as traditions go, the song was harmless. Bringing back “Brass Bonanza” was the single greatest decision McGuire made in Hartford, and the song would remain the team’s celebratory goal song for the rest of its days in Connecticut. A few years down the road, however, the franchise up and moved to Carolina to become the Hurricanes, and the Whalers were no more. With many of the Whalers’ players, the Hurricanes won the Stanley Cup. Sadly, “Brass Bonanza” was never played for the franchise’s most important celebration. “Brass Bonanza” remains one of the most iconic songs in all of sports. It is the sound of old-time hockey; an anthem of celebration, and an ear-worm forever doused in blue, green and white. 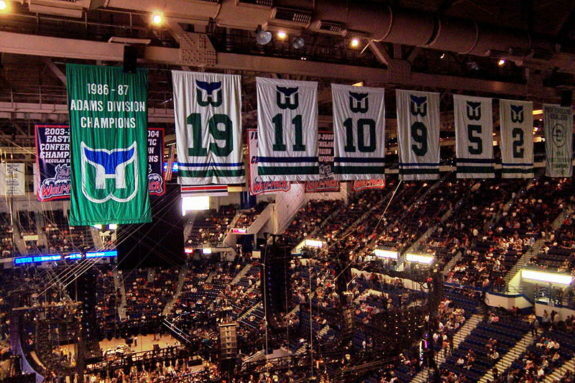 In New England, there is nostalgia for the Hartford Whalers. Their “W” logo (or is it an “H”?) remains one of the most popular brands in the vintage sports market, and along with it, “Brass Bonanza” continues as the theme song for those who are still holding out hope that the team will return to the northeast. 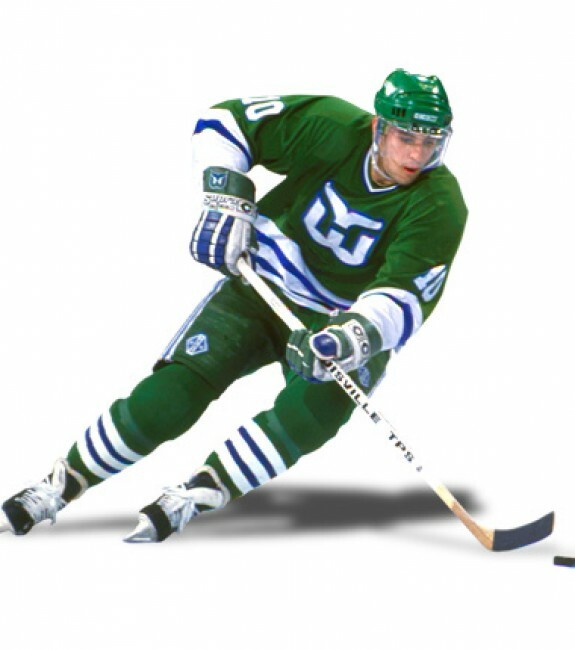 In many ways, though the Whalers moved to North Carolina, “Brass Bonanza” was never silenced. The team may not be coming back, but the song remains the same. To this day, organists around the country (especially those in New England) continue to keep the song in their repertoires during games. For a couple of years, the Hartford Wolfpack (the AHL affiliate of the New York Rangers) continued to play the song after every goal for the home team. Minor league baseball teams in State College, PA and New Britain, CT have used the song. Red Sox/Fenway Park organist Josh Kantor recently recorded a new version of it, and if you were watching this year’s Stanley Cup Final, you might’ve noticed that Nashville Predators organist “Krazy Kyle” paid homage by playing the song in between whistles. The University of Connecticut hockey team is the only team committed to “Brass Bonanza” and the team continues to use it as their goal song, keeping the tradition alive. It’s unlikely that hockey will ever again have a song like “Brass Bonanza”, and depending on who you ask, that’s probably a good thing. Kids these days just don’t appreciate a good jaunty tune when they hear it. It used to be all about the brass, man. “Brass Bonanza” is perfect in every way. It’s cheesy, it’s fun, it’s hockey. There’s a reason why it’s still played at games. People want to hear it, and they want to relive the memory of a brand of hockey that once was. The song, for all its bravado, maybe the Hartford Whalers’ greatest and most memorable contribution to the NHL. That being the case, it’s a good thing Ducharme didn’t go with another Ysaye recording.